These sugar & spice glazed pecans are sweetly spiced with a touch of heat and are perfect to keep on hand for salads, charcuterie boards, or for snacking. If there is a store bought substitute for these yummy sugar & spice glazed pecans, I haven’t found one. I absolutely consider these pure gold, especially in busy months where entertaining is frequent. These are my favorite glazed nuts for salads and the perfect complement to blue cheese and gorgonzola. This recipe works well using walnuts also. I make sugar & spice glazed walnuts to put in Olexa’s Walnut Goat Cheese Salad Copycat Recipe. This oven method is my favorite way to glaze nuts, as it takes less than 30 minutes (not including allowing nuts to harden). 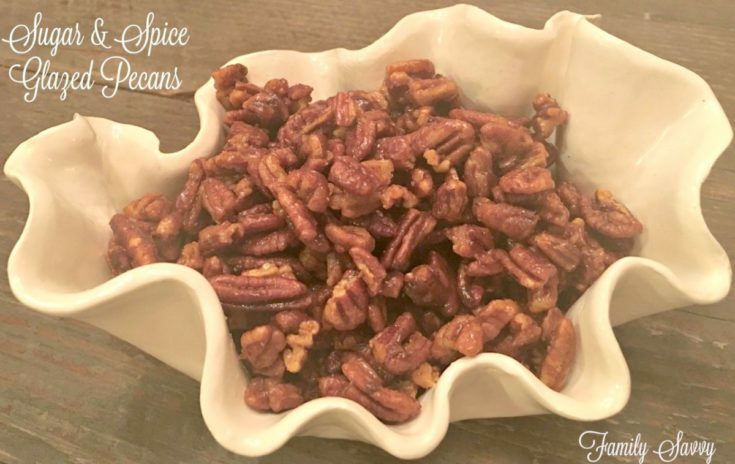 If you have more time, you can also try Sugar & Spice Pecans Made in a Slow Cooker. Either method will yield yummy, crunchy, sweet & spicy nuts that you’ll love having on hand. Make ahead: These nuts are perfect for making ahead and keeping on hand as needed. For best results, these nuts should be stored in an airtight container or in the freezer. They keep well for up to 6 weeks. If you make these, I’d love to hear from you; please share your thoughts in the comments below. As always, thanks so much for stopping by. Be blessed, and stay savvy! This recipe works well for any nut, especially walnuts, almonds, or pecans. They are delicious and absolutely addictive. Cover large cookie sheet with parchment paper or foil coated with cooking spray. Spread nuts on cookie sheet. Bake for 10 minutes, stirring after 4-5 minutes. While pecans are in oven, mix butter, brown sugar, cinnamon, cayenne pepper, maple syrup, honey and salt. Stir until smooth. Remove nuts from oven. Pour into bowl of syrup, and stir until nuts are completely coated. Spread nuts evenly onto cookie sheet. Bake for another 10 minutes, stirring after 4-5. Remove from oven. Nuts will harden as they cool. Store in an airtight canister.